Silent Hill: Homecoming proves that a game series can still remain scary and true to itself while changing elements that define it. 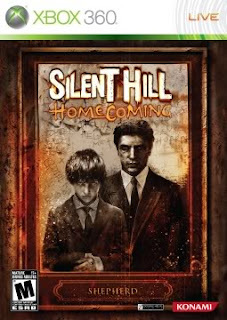 Homecoming follows a man named Alex Shepherd whose family was one of the four founding families of Shepherds Glen, a town located across Toluca Lake from Silent Hill. Waking from a dream in which he sees his younger brother running away while exploring a hellish hospital, Alex returns to Shepherds Glen in order to find his missing brother. Things are worse than he first imagined, though, as his mother is catatonic, his mentally abusive father has abandoned the family, and a childhood friend reports that more people go missing every day. As he continues chasing after his brother, talking to several of the citys prominent leaders in the process, he travels through Shepherds Glen and Silent Hill, discovering the truth to Joshs disappearance and the secret history of his familys heritage. The storyline itself is very interesting, and the symbolism involved is rather profound. Taking its enemies into the darker corners of Alexs past, the creators at Konami have once again hinted towards the truth through bosses, enemies, and sceneries, mixing symbolism with the background to the game. Enemies, which range from nurses to underwater lurkers to creatures which walk on needles, are all scary but rather easy to kill given the right weapon. It takes very little practice to master the games combat system, yet fighting on the whole is somewhat clunky. Alex receives a variety of weapons throughout the game, and it is explained that he can handle most without training due to his background in the military. Therefore, Alex easily wields weapons such as knives, pipes, and even guns, but the game does a somewhat poor job of making combat as seamless as possible. Guns tend to lag when fired, and enemies will freeze for split seconds when shot. It is much more efficient and satisfying to play the game without guns at all, but when the time calls for some heavy firepower, players will be met with a bit of lag. The sights and sounds in Homecoming are highly impressive. The graphics appear to be taken out of an old photoshoot, as there is always a bit of fading in the details of scenery and characters, particularly in the hellish versions of Silent Hill and Shepherds Glen. Rather than taking away from the experience, this touch makes the events that are happening truly seem otherworldly. Overall, graphics are very bleak and gray while nightmarish and dark in the hell counterparts, making for a beautifully disturbing game. Lighting is once again a crucial factor, as enemies are attracted to Alexs flashlight as well as light from objects such as televisions. However, on default mode, the game is almost too dark, to the point that players will have to turn the brightness level up just to see what they are doing. It is nice when things are dark and scary, but there is a point when players just have to be aware of their surroundings. The sounds of the game are just as good as the graphics, and voice acting is also well done. The only flaw is that dialogue is spoken very softly, making it difficult for players to hear at times. Subtitles help immensely, but surprisingly subtitles oftentimes do not align with what characters are saying. A word or two is off or the timing is wrong, making it difficult to follow along if players are relying solely on subtitles (which they should not have to do). However, the soundtrack to the game is phenomenal, and Akira Yamaoka has once again made magic with gruesome sounds and terrifying noises. The game features a lot of exploration, and maps are, as they are in all Silent Hill games, extremely helpful. Traveling in the game can get pretty tedious, though, as players will backtrack through multiple areas numerous times in order to gain new items, talk to different people, or simply retrace their steps. Save points are scattered haphazardly around the worlds of Silent Hill and Shepherds Glen as well, making it hard to gauge when the next save point will be. Some save points come within five minutes of each other; others may take up to an hour to find. Furthermore, Homecomings puzzles can be a bit tiresome, including several tablet puzzles where players need to move pieces on a board in just the right way to proceed. These are frustrating, in that when a player gets stuck, they must exit and return in order to reset the puzzle, if it resets at all. With the lack of save points in certain areas, this can make for some disgruntled players. There are plenty of hidden items to find during Alexs travels, including photos taken of the various Shepherds Glen citizens, drawings left behind by Josh to be used as clues, and powerful weapons. Obtaining these items can be tricky at times, but the rewards are relatively good. Not only are there achievements to be unlocked, but they add a layer to the overarching story that makes it worthwhile to explore. With so many items to find, the inventory system is laid out somewhat nicely, yet it stops overall gameplay and can be tricky to maneuver when in the middle of combat, as players must choose from a wheel what items they wish to use. Silent Hill: Homecoming has its flaws, but compared to the entire game, theyre actually relatively minor. The game itself is a great, in-depth story that is both horrific and inspiring. With five available endings for players, along with many unlockable items including outfits and weapons, there are plenty of reasons to replay this game. Achievements are relatively easy to get, as it only takes two or three playthroughs to unlock them all, but with such a good storyline, players will want to play it to relive the experience instead of just obtaining points.